thaumetopoea pityocampa, which lays eggs in pine trees. The caterpillars which I photographed here in 2009 have irritant hairs, which they shed and can cause problems to mammals, especially dogs and humans. 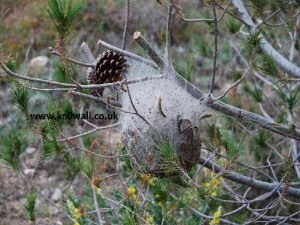 Their cocoon type nests will appear in pine trees around November – December. This is the time to deal with them. The way I deal with them is to cut out the nests from affected branches and dispose of them. Some people will spray them first with hair lacquer to contain the hairs. Others burn the removed nests. The more you destroy this year, the less you may have next year as it disrupts their life cycle. Whichever method you use, be very careful not to get any hairs on your skin, in your eyes, etc. In case of need, seek medical help.